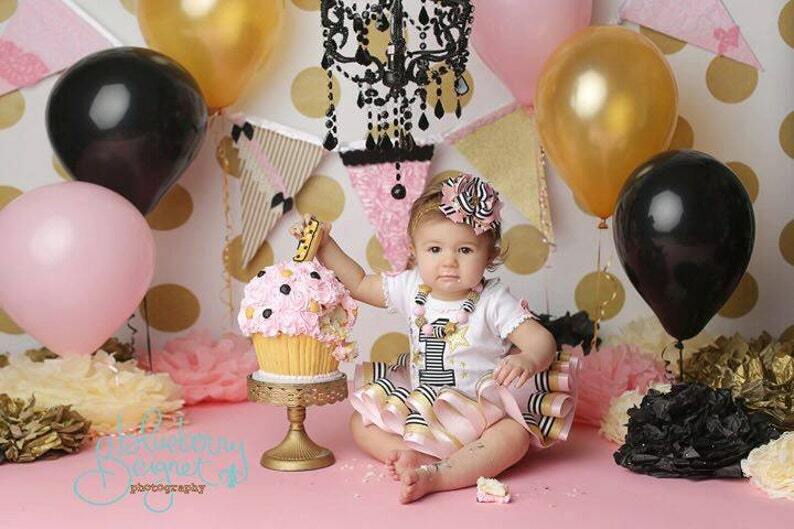 This listing is for a beautiful twinkle star themed birthday set in black striped, soft pink, and sparkly gold consisting of a personalized embroidered shirt and tiered ribbon trimmed tutu. You have the option to add the matching stacked boutique bow and chunky beaded necklace. SHIRT: The shirt features the birthday girl's name and age with glittery gold stars. ***Please Be Sure to Leave the Name and Age Needed in the 'Notes to Seller' Section at Checkout. *** Bows are attached to each sleeve. *Bows will not come on long sleeve shirts. * All embroidered items are finished with a soft backing to protect sensitive skin from scratchy stitches. Wash inside out on gentle cycle and hang to dry. Do not use bleach. Iron inside out on low heat without steam. BOW: The bow measures 4-5" wide and comes finished on your choice of an alligator clip, alligator clip with high quality silicone non-slip grip, french clip, hard headband, or elastic headband. Please leave your selection in the 'notes to seller' section at checkout. If no choice is made, bow will be sent on a lined double prong alligator clip with non-slip grip. Rhinestone/Ribbon colors/styles may vary depending on stock. Girls Pink and Gold Giraffe Appliqué Shirt & Ribbon Tutu Birthday Set w/Matching Headband and Chunky Necklace. Jungle, Safari, Circus, Zoo. Girls Pink, Aqua, Gold Twinkle Little Shooting Star Appliqué Shirt and Ribbon Tutu Birthday Outfit w/Matching Headband and Chunky Necklace. Girls Black, Pink, and Gold Royal Princess Appliqué Shirt and Satin Ribbon Tutu Birthday Outfit w/Matching Boutique Bow and Chunky Necklace. Girls Hot Pink and Gold Royal Princess Appliqué Shirt and Satin Ribbon Tutu Birthday Outfit with Matching Boutique Bow and Chunky Necklace. My daughter wears it on her first bday! I love it!!! This tutu is soooooooo adorable!! Much cuter in person. Fast shipping and great communication!!!! Girls Black and Yellow Bumble Bee Themed Appliqué Shirt and Ribbon Tutu Outfit with Matching Stacked Boutique Bow and Chunky Necklace. Girls Pink and Gold Vintage Ballerina Appliqué Shirt and Ribbon Tutu Outfit with Matching Headband and Chunky Necklace. Retro Ballet. Girls 3D Cupcake Pink, Aqua, and Sparkly Silver Appliqué Shirt and Ribbon Tutu Birthday Outfit with Matching Headband and Chunky Necklace.